Beginning Monday, July 16 – Friday, August 10, a free bus will run from Philmont through Stottville into Hudson for Youth, Grades K-12, in the morning at 8:15am and returning after 4:00pm. The route begins in downtown Philmont, goes through Claverack, Stottville and Greenport and continues to Hudson, dropping youth off at summer programs at Oakdale Lake, the Youth Clubhouse, the Hudson Area Library and Kite’s Nest. The bus will return from those locations in the afternoon, dropping off at the same stops as it picked up. 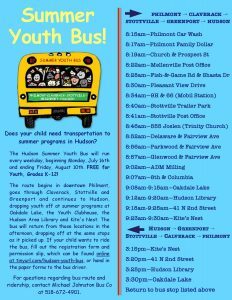 If your child wants to ride the bus, fill out the registration form and permission slip, which can be found online at tinyurl.com/hudson-youth-bus or hand in paper forms to the bus driver. Paper copies and copies of the stops on the bus route will be available at the library. This entry was posted in Adults, Children, News, Young Adults by Brenda Shufelt. Bookmark the permalink.